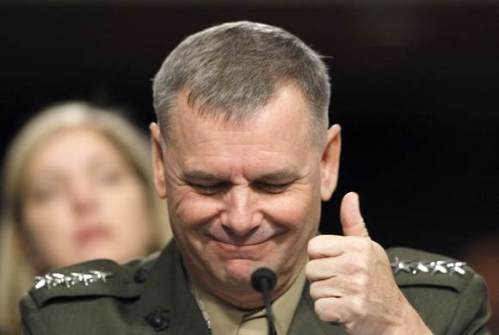 Even with Marine Gen. James Cartwright likely retiring by the end of the summer, the military will likely retain four four-star Marine generals. That much seems obvious, even as speculation swirls over who will replace Cartwright as JCS vice chairman. No Marines are believed to be in serious contention for the four-star position, which Cartwright has filled since Aug. 31, 2007. Instead, rumors have centered mostly on Air Force Gen. Norton Schwartz. Cartwright was believed to be a prominent contender to become the next chairman, but, citing a defense official, the AP reports that Obama informed Cartwright last weekend that he was no longer in contention. That may make it official, but Cartwright’s candidacy for the chairman job has been doubted for weeks. Bob Woodward’s 2010 book, “Obama’s Wars,” highlighted a growing rift between Cartwright and other Pentagon leadership. His judgment was called into question again after the release this year of a Pentagon investigation into claims of misconduct with a female aide. Cartwright was cleared of having an inappropriate relationship with the woman, but the investigation found that he allowed the aide to either pass out or fall asleep in his hotel room, where he was working and his security staff stood nearby. It wasn’t widely noted at the time, but another sign that Cartwright’s career was ending may have come when Obama announced April 28 that he had nominated Marine Lt. Gen. John Allen to become the top commander in Afghanistan beginning this fall. Conspicuously, Allen was not nominated for a fourth star at the time, even though he will be taking over the military’s highest profile combat assignment from the retiring Army Gen. David Petraeus. Officials still haven’t said Allen will be promoted, but it seems imminent. That means another four-star general or flag officer will likely retire somewhere in the military. Under U.S. law, only two four-star Marine officers can serve in the Corps at any one time. However, other four-star Marines can lead joint commands, or serve as JCS chairman or vice chairman. The president also can increase the number of three- or four-star generals in one service as long as there is a corresponding decrease in another service. Currently, there are four four-star Marines, three of whom appear to be locked in for the immediate future. Gens. Jim Amos and Joseph Dunford fill the four-star slots in the Corps as commandant and assistant commandant, respectively. Gen. Jim Mattis fills a four-star billet as the head of CENTCOM, taking command there in August. That leaves Cartwright — whose current gig ends in August, just before Allen is expected to take over as commander in Afghanistan. It seems reasonable to expect Allen would pin on that fourth star at that time. Too bad about Gen Cartwright – lucky for the service and the country, we got 40 years out of him. Thanks for your service General. The ankle-biters in the Pentagon and detractors in the WH & other uniform services may not, but a lot of other people do.